The Seven Beauties of Science Fiction by Istvan Csicsery-Ronay Jr.
We’d love your help. Let us know what’s wrong with this preview of The Seven Beauties of Science Fiction by Istvan Csicsery-Ronay Jr.. Preview — The Seven Beauties of Science Fiction by Istvan Csicsery-Ronay Jr.
To ask other readers questions about The Seven Beauties of Science Fiction, please sign up. Lo he terminé ayer. Estoy muy orgulloso de haberlo terminado, la lectura en inglés más complicada a la que me he enfrentado antes. Le pongo un 3,5/5 por lo críptico y complicado de algunas explicaciones, pero la buena nota es por lo interesante de la obra, que sin duda me ha abierto mucho los ojos, además de las gratas explicaciones en los blogs donde se ha hecho la lectura conjunta. My overall impression of this book was that it was trying so hard to be exclusive and elite that it almost became nonsensical. Yes, I understand that it contributes to a larger conversation. However, if you look at Johanna Russ’s discourse on feminist science fiction, or Sterling’s, LeGuin’s, and Atwood’s nonfiction writing as a writer-critic, or even Auerbach, Marx, and Bakhtin (all names with whom Csicsery-Ronay Jr claims to be ‘in conversation’) they are still trying to reach the public and actually have a discourse. When you purposely make yourself so inaccessible, you might as well be ranting in a dark room, in solitary confinement. It was clear to me that he wanted to fit in to the ‘philosophy’ department more than the literary analysis and criticism department, or the literary studies in general. In some sections, he overcomplicates topics that are so simple with his verbose and restrictive writing style. For instance, in the section on fictive neology, the entire passage sounds like an anthropology paper on humans as an overview. “Languages have an inherent potential for development through their interaction with the discourses of other cultures and their own internal elaboration.” Yeah...we know. You’d find yourself reading pages upon pages of just common sense knowledge of real humans in the real world but told in his style. I also found this work to be limited by the few sci-fi works that Csicsery-Ronay has read. While he references certain things here and there from a wider range, he goes into detail on only a few works but almost in every chapter. You can tell he’s definitely read properly Solaris, the Kim Stanley Robinson books, few works by Ursula K. LeGuin (if not one) and some of the 19th century classics…but there are so many other works to consider (especially when this was published in 2008). I think he barely dips into science fiction works and extracts a very superficially well-known theme and then starts ranting about it in a way only Philosophy students would understand. This becomes crystal clear the moment you encounter chapters dedicated to Kant, Adorno, and Burke. Sometimes he just name-drops titles without even discussing them, to get them to fit into his ‘totally-unrelated-to-sf’ thesis. Those two frustrations aside, the book gets good once you get used to his use of language about mid-end of chapter one. Once he begins to engage with science fiction works (though few) I actually really enjoyed it. The title for this work is inspired by the medieval Persian allegorical romance The Haft Paykar—a tale of mystical love and moral enlightenment, in which a prince falls in love with seven beauties and upon visiting each of them in a week, each bride tells him a new allegorical story. 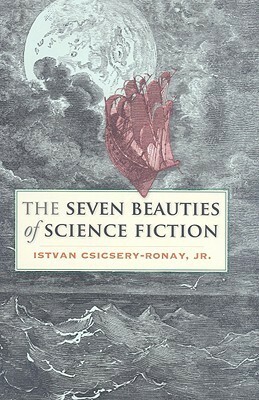 Istvan Csicsery-Ronay Jr. appropriates the seven beauties to the form of “categories” found science fiction (which he calls science-fictionality)—of which one work may contain several. Excellent book. Instead of discussing the genre historically, it focuses on its characteristics and analyses it in a clear, concise way that at the same time demonstrates the author's vast knowledge of the topic. Dense and difficult, yet Csisery-Ronay's work goes a long way towards explaining the structures by which science fiction operates. I cannot now read a work of science fiction without noticing its novums, its wordplay, or its ludic quality, or other structures; and noticing these structures in a way that aids interpretation. Yet Csisery-Ronay's work buys into critical theories (including psychoanalysis and queer theory) heavily, relying not only on the mental models supplied by a theoretical appro Dense and difficult, yet Csisery-Ronay's work goes a long way towards explaining the structures by which science fiction operates. I cannot now read a work of science fiction without noticing its novums, its wordplay, or its ludic quality, or other structures; and noticing these structures in a way that aids interpretation. Yet Csisery-Ronay's work buys into critical theories (including psychoanalysis and queer theory) heavily, relying not only on the mental models supplied by a theoretical approach to literature but on the language as well. This is a problem for me for two reasons. One, given that critical theories only developed in the last hundred years or so of literary study, I find their value in interpretation limited; I am belong to the New Critical school myself, and prioritize close textual analysis above the sometimes-facile glosses which theory provides. "Even lyrical and performative sf texts that reject the epic conventions of the genre depend on the vast megatextual background of completed futures established in sf's archive of constructed worlds." "Chaos and emergence theories provided the essential notions that the character of complex systems is profoundly sensitive to changes in initial conditions, and that their existence depends on a virtually incalculable number of contingent factors." "Many alternative histories are constructed by voiding a break that occurred in real history, using the conceit of removing a real novum, and modeling what happens when extrapolation continues without having to adapt to particular impediments of experience. A novum that is not detectable may no longer be a novum, but a point of alternative linear origin, with no trace-memory of its obliterated past." "The prosthetic concepts of sf are, like most prosthesis, prone to become fetishized in classically psychoanalytic fashion, taking on the energy and mana of the longed-for complete and satisfactory worldview, a utopian consummation that the real body of scientific concepts lacks - a fact continually marked by the generation of new fetish-supplements." Can I understand these? Sure, eventually. Yet the guesswork that goes into piecing together his meaning slows my reading down, and makes it difficult to follow the overall argument. I understand that this is a critical academic work, but I am myself an academic, and I have always held that academics should as much as possible speak like real people. I also felt as though Csisery-Ronay relied on the same few examples too often. Solaris comes up again and again. So does Dune, Alien, and the Martian Chronicles. If you're not familiar with these texts, Csisery-Ronay's points will be difficult to follow. Since Solaris, Dune, Alien, and the Martian Chronicles all loom large in critical studies of sf, Ronay's reliance on them is not a problem, except that he only briefly mentions other (and I think perhaps better-known) canonical texts: Do Androids Dream of Electric Sheep?, Childhood's End, the Forever War, and Canticle for Leibowitz, to name a few. Casting his net wider for more examples would, I believe, have made this text more accessible. But I have started to fuss. As an academic who teaches at a tiny college in the Midwest, and often hungers for good critical talk about literature, reading such an in-depth and relevant study was a pleasure. Recommended. Just don't expect it to be a quick read. In chapter 5 of this book, author Csicsery-Ronay draws parallels between the "sense of wonder" in science fiction and the notion of "the sublime" in the philosophical writings of Emmanuel Kant and Edmund Burke. That one point of discussion is typical of the book, and I think it stands as a good way to encapsulate what the book is like and where it's coming from. "Seven Beauties" is a piece of scholarly academic writing, and therefor is dense in style, laced with jargon, sometimes convoluted in se In chapter 5 of this book, author Csicsery-Ronay draws parallels between the "sense of wonder" in science fiction and the notion of "the sublime" in the philosophical writings of Emmanuel Kant and Edmund Burke. That one point of discussion is typical of the book, and I think it stands as a good way to encapsulate what the book is like and where it's coming from. "Seven Beauties" is a piece of scholarly academic writing, and therefor is dense in style, laced with jargon, sometimes convoluted in sentence structure, and formidable in its vocabulary. While I wouldn't say that a graduate degree in philosophy or literary theory is a requirement to understanding this book, it sure would help. But on the other hand, with enough patience, enough willingness to read some sentences and paragraphs 2 or 3 times over, and perhaps with the help of a dictionary or two, any reasonably educated SF fan should be able to struggle through it. Personally, I often didn't have the patience to reread and re-reread the book's many difficult passages, so I'm afraid quite a few of Csicsery-Ronay's ideas went sailing over my head, their presentation too stratospheric to even ruffle my hair. But certainly not all of his ideas. At times I found Csicsery-Ronay's prose quite lucid, and at those times his ideas were usually interesting and enlightening. I remember in particular finding his discussion of the use of language in Dune quite intelligent and informative. Science fiction is a great, big, gaping hole in my life, as I discovered when I realized I'd not read any of the books or seen any of the movies referenced in this critical work. So there were a whole bunch of spoilers, but also a bunch of titles I am now interested in reading. Many of them are on my reading list for this class (c'mon--I'm crazy but I don't read sci fi lit crit for giggles). I'm far from up to snuff on literary criticism, but this strikes me as a really good roundup. It's dense, Science fiction is a great, big, gaping hole in my life, as I discovered when I realized I'd not read any of the books or seen any of the movies referenced in this critical work. So there were a whole bunch of spoilers, but also a bunch of titles I am now interested in reading. Many of them are on my reading list for this class (c'mon--I'm crazy but I don't read sci fi lit crit for giggles). I decided lit-crit of SF would be an enlightening experience for me. Like eating bran for your brain. Not necessarily because it's a (wait for it) good read. Book takes 7 major themes in SF, such as imaginary science and representations of the sublime, and traces them through SF history. Bottom line: glad I read it. Doesn't fit into my use of star-ratings, so I am leaving it unstarred. Be sure that you have your phone fully charged when you start reading this. You are going to google more words than you ever have in your entire life, and likely kill your battery doing it. But despite its denseness in vocabulary it is a fully comprehensive guide to reading science fiction academically. I have met the author through my school and can also add that he is a very personable guy and can break down the density of these pages for. I don't know why academics are writing like this. Absolutely essential stuff. Love and passion. Deep understanding of the genre characteristics. Most of my misty insights are beautifully outwritten here. Maybe it's a Marxist approach to the genre, which usually attracts negative associations in Polish reception (no surprise), but so lovely energetic and powerful at the same time! Beauty. The 8th. While a very interesting subject, it was a very hard read. The introduction said that he was trying to write for a non-academic audience but then found that he couldn't, and it showed. A dictionary of a must for this book. The strangest part so far was the digression into the importance of science fiction music – not something I’d even heard of before! It's a majestic explanation of the genre's pleasures - and so well writ that it can only be consumed with concentrated focus. I didn't read enough of this to really rate it. What I did read was unintelligible. Oh, academic writing. I had such high hopes for this book, too. Professor of English, DePauw University . Books by Istvan Csicsery-Ronay Jr.